THURSDAY, 24 MARCH – Three students who are currently undertaking their Doctor of Philosophy (PhD) degree will represent Universiti Malaysia Sabah (UMS) at the “3 Minute Thesis Competition 2016” national level after securing places at the competition at UMS level held yesterday. They were Ruslan Mapeala, Lai Yun mei and Lorita Angeline, who would represent UMS under their respective category, Social Sciences, Science and Technology and Engineering. They will compete at Universiti Utara Malaysia (UUM) on 10 May for placing to the international level, representing Malaysia. 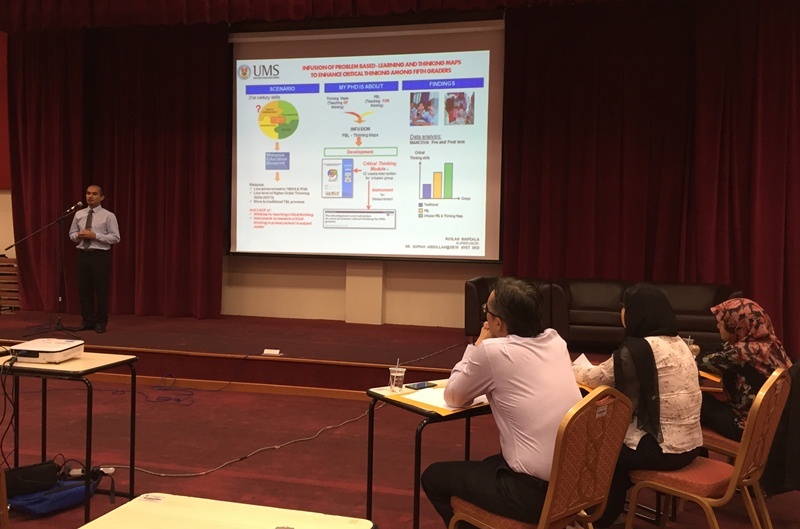 Meanwhile, the UMS level competition saw eight third year PhD students competing, an programme organised by the Centre for Postgraduate Studies, UMS. All winners received cash prize of RM200 each and certificate whilst the rest of the participants received certificate of appreciation.